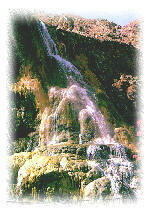 Hammamat Ma'in is another favored spot, with a hot waterfall, thermal springs, and a full complement of resort facilities. Close by are two sites linked by tradition to Herod the Great. One is the palace at Makawer (machaerus), where Salome traditionally danced, and where John the Baptist was beheaded; now Hamamat Ma'in, the thermal mineral springs, where Herod was said to have bathed in its medicinal water, where people have come for thermal treatments or simply to enjoy a hot soak, since the days of Rome.